After reading "Mozart in the 21st Century" by Ron Pruitt, a few thoughts on the events portrayed in the story came up, mainly related to human cloning. Here's how students feel about cloning! Read on and feel free to comment, too! 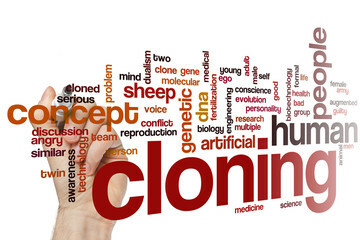 In my opinion, cloning can be helpful or not, it depends on what we will do with the clone. If the clone is for helping people, that need organs or something like that, I am in favour. If the clone is to become a slave, or something like that, I am against cloning. So I can say that, in my opinion, it depends. My idea changes depending on the situation because if it is used for medical purposes it can save lives, for example in cancer cases. In any other away, cloning is not a natural thing for me. Yes and no, depending on the circumstances, on the type of cloning. With therapeutic cloning I agree, but with reproductive cloning I no longer agree. I´m in favour of cloning because it would be interesting to have someone like me, and sometimes to do stuff for me if I was tired. In my opinion, I believe that human cloning will exist one day. It would be good, because we could have more free time and rest more, if we cloned ourselves! I think I'm neither in favour or against cloning. It's a big step in science and technology, but mankind has sort of started to give that step by cloning a sheep named "Dolly". But, still, I think it will take some time, perhaps a couple hundred of years, or maybe even less, to successfully clone a human being. And if we think about it, if we all cloned ourselves, the world population would duplicate, thus causing a severe over usage of our resources, eventually making them disappear, which would lead to some serious problems in our planet.